Hostmein Review 2019: Is Hostmein a Good Hosting? Hostmein is a Greece-based website hosting provider that serves primarily Greek and Cypriot customers with 100% cloud-based hosting. Founded in 2011, Hostmein is a website hosting provider based in Greece. They currently host more than 3500 domains for more than 1200 clients, and they have 73 physical servers in 6 data centers. Their website is in Greek, which might be fine for their mostly Greek and Cypriot customers, but it can also easily be translated into English by your browser. And they provide support in English too. Hostmein is a full-service website hosting provider offering shared cloud hosting, reseller hosting, virtual private servers, dedicated servers, colocation, domain registration, and SSL certificates. Hostmein has its own servers with RAID 10 storage, but they are colocated in other companies’ data centers at six locations across Europe and America. While this is quite common, it might affect website speed and response times for technical issues. Their shared hosting is housed in the only Tier 3 data center in the Balkan area, which has also been awarded a LEED V4 Gold Award. But not all their data centers are Tier 3, as confirmed by a quick call to support. They also have no clearly advertised uptime guarantee. Hostmein offers added value with its security features, some of which are included in the regular packages whilst others are optional add-ons. The regular packages include BitNinja software to protect your server against malicious attacks, denial of service (DOS) attack protection, antispam manager, antivirus protection, and the CageFS sandboxed file system. At additional cost, you can purchase monthly support services so that Hostmein will monitor your website for security and technical issues. Hostmein is slightly more expensive than local or international providers, but I’d personally be happy to pay a little more for a Tier 3 data center (shared hosting only) and RAID 10 SSD storage. Pricing is quite rigid and can only be purchased in one-year terms. There is no monthly contract, and no multi-year terms with discounted rates. There are also no free trials, no freemium plan, and no money-back guarantee. You can contact technical support by telephone, email, Skype, and Facebook messaging. I have contacted them via Facebook several times during the daytime and I’ve always received a rapid and helpful response. The call center is open from 10 am to 6 pm, and the ticket support system is available 24/7/365. I’d love to use live chat, but there is none. Hostmein is a 100% cloud-based website hosting provider with data centers around the world. They have formed strategic partnerships with companies such as Cloud Linux, Parallels, and R1Soft, and they support the new IPv6 internet addressing protocol. 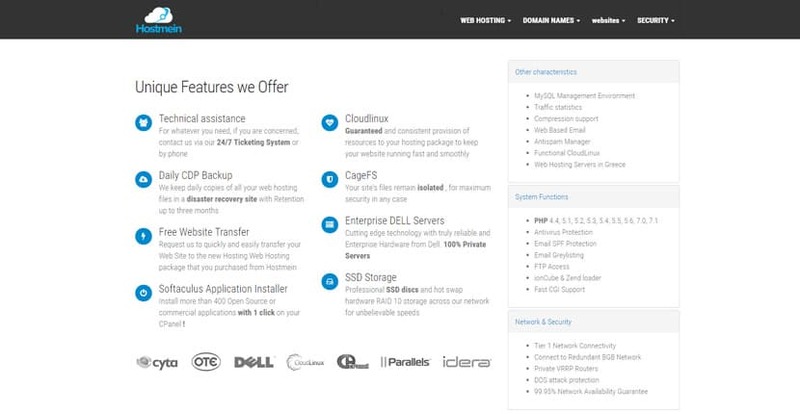 Wondering how Hostmein stacks up against other Web Hosting companies? Enter any other Web Hosting company and we will give you a side-by-side comparison.